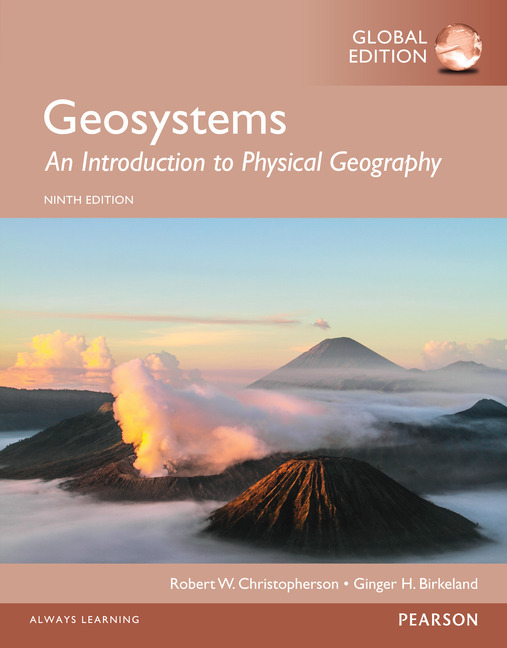 The Ninth Edition can be made available with MasteringGeography™ , the most effective and widely used online tutorial, homework, and assessment system for the sciences. Note: You are purchasing a standalone product; MasteringGeography does not come packaged with this content. MasteringGeography is not a self-paced technology and should only be purchased when required by an instructor. Personalize learning with MasteringGeography: MasteringGeography provides students with engaging and interactive experiences that coach them through introductory physical geography with specific wrong-answer feedback, hints, and a wide variety of educationally effective content. Leverage strong pedagogical tools and a structured active learning path: The text reinforces central hallmark physical geography themes of Earth systems, human-Earth relations, and global climate change by providing a consistent framework for mastering chapter concepts. Teach with current and relevant content. An emphasis on currency provides students with compelling reasons for learning physical geography. NEW! Geosystems in Action explore key chapter concepts with a focus on visuals and structured active learning. Located in each chapter, each feature reinforces Earth systems methodology and connects students to related online media via QR codes. NEW! The Human Denominator features connect abstract concepts to real world environments and focuses on the human-Earth dimension of physical geography. REVISED! Geography Fundamentals provide a more comprehensive overview of the Scientific Method. Key Learning Concepts on the chapter opener page list primary learning outcomes for the chapter. Critical Thinking Questions are integrated into appropriate sections of each chapter, giving students the opportunity to stop and demonstrate conceptual understanding and practice critical thinking as they read. Geosystems Connection at the end of each chapter precedes the Key Learning Concepts Review to bridge different chapter concepts by reminding students where they have been and where they are headed. Key Learning Concepts Review reinforces the key learning concepts in the chapter, providing summaries and key terms under each Key Learning Concept identified on the chapter opener. Updated content provides students and instructors with the most significant and current information and applications. NEW! New Chapter 11 on Global Climate Change provides an up-to-date overview of the current climate change science: evidence for change, climate models, climate forecasts, and ways to mitigate future change. NEW! Ginger Birkeland joins Robert Christopherson as co-author, bringing a fresh perspective and new examples that enhance the relevance of such content as Geosystems Now, Focus Studies, Critical Thinking, and GeoReports. Revised Geosystems Now chapter-opening vignette case studies draw students into the material by discussing an interesting, current application of the chapter concepts. NEW! Geosystems Now Online is a short section at the end of Geosystems Now providing online links to additional materials for further investigation of the topics discussed. Updated Focus Study essays present additional, in-depth discussions of key geography topics, without interrupting the flow of the core chapter narratives. These essays allow students to actively participate and engage in the content instead of just reading. GeoReports present factoids, examples, applications, or student action items that relate to the material in the main text narrative.